Hello there! 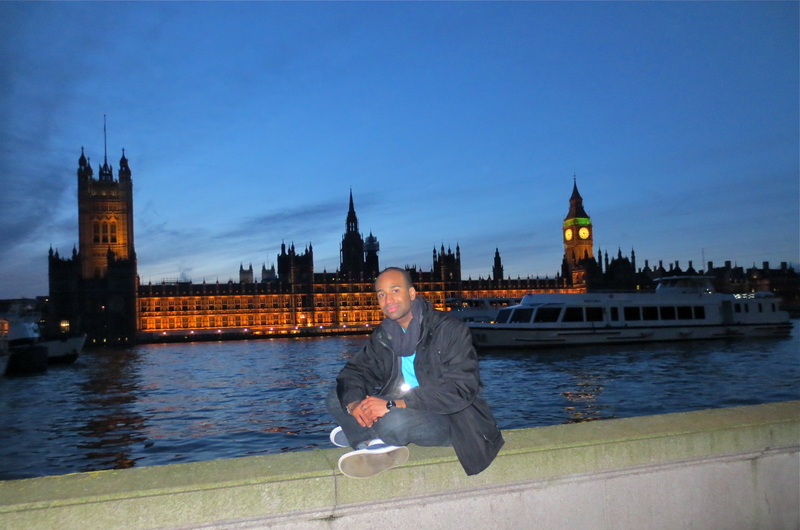 Now that I’ve been in the United Kingdom for about a month, it’s time to tell you about my amazing study abroad experience at Regent’s American College London (RACL). 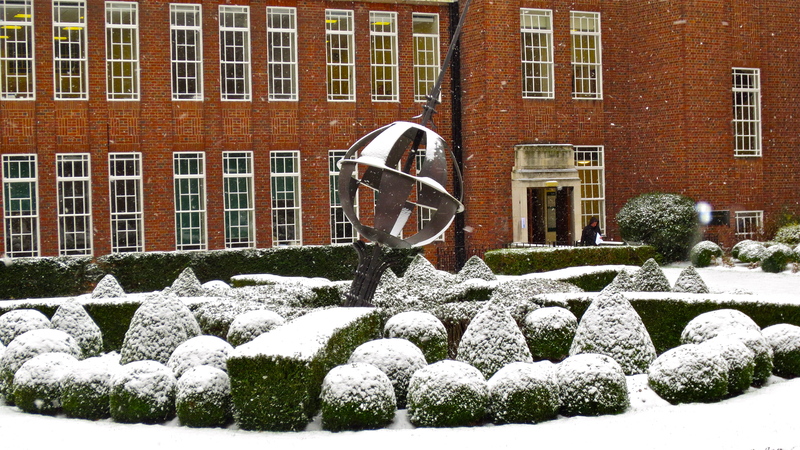 Regent’s College is a private school located in Central London. It is made up of seven schools; Regent’s American College being one of them. 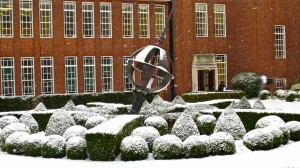 Regent’s College is among the top schools in London and it is one of the most expensive ones! One thing that I LOVE about the college is that all the buildings are connected, which means that I don’t have to go outside to go to classes! I live in a dorm called Reid Hall… nothing compared to Centennial Hall! The dorm is 4-stories tall, it has a common area on the first floor, kitchens on every floor (with no stove or oven!) and laundry facilities (which you have to pay for). I live in a double room. I have an American roommate from Ohio. He is pretty chill, so we get along really well. We have a couple of things in common, like for example: we’re both business majors and have an interest in Finance! Our room is located on the non-existent floor… Yes, the non-existent floor! The British call the second floor the first floor and the first floor the ground floor, so we live on the ground floor, which is what we call the first floor… Confusing huh? Did I mention that British people do not know what the word PRIVACY means?! You can literary see when people are taking a shower because ALL the showers have see-through glass doors… AWKWARD! Me in front of the English Parliament. Well, moving away from such details, I am currently taking four classes for a total of 12 credits. Cultural Diversity in the Media is my favorite class… let me tell you a story. Before I even attended this class for the first time, I was going to drop it because it is only offered on Wednesdays & Fridays (let’s be honest, who wants to take a Friday class while studying abroad? are you CRAZY?). Well, I do not know exactly what happened, but the professor convinced me to stay in the class with the only condition that I would miss every Friday class for which I had weekend trips planned out for. Hey, it’s not too bad… class doesn’t start till 14:00… oops, I’m sorry, I meant to say 2:00 pm. At least I can stay up all night long and sleep in all day before class! LOL. Oh, did I tell you that I got paid $50 for talking about Facebook on a research project my professor was conducting? Well, to be honest with you, at first I only signed up because of the money (who wouldn’t? ), but besides the fact that I got paid and ate a lot of food, I actually thought it was a really interesting research. My Literature class on the other hand … let me not even talk about this class because I had promised two friends of mine that I will not complain about it anymore. All I have to say about this class is that I swear my professor thinks he is Romeo from the playwright Romeo and Juliet LOL. He makes the class more interesting than it should be. Anyway, if I tell you that I only spent about $40 on textbooks, you will say that I’m the biggest liar ever! Well, the fact is that you don’t necessarily need to buy textbooks here. Mostly all of the textbooks are available at the library (which is a good thing cause you can save money for other things). But don’t worry too much about it though cause textbooks here aren’t too expensive anyway. I spent 25 pounds (about 40 USD) on a textbook for one of my business classes. In America, I would have to spend $150! To finish talking about the school, let me now talk about food last since you’re supposed to save the best for last (sarcastic voice). True is that the food at the Saint Rose dining hall is 102% better than the food here, you might think I’m exaggerating… well, I’m not! The school has a main dining hall, which I like to call the Refectory, a deli inside the Refectory and a place called Brasserie (French for Brewery), which makes no sense because as far as I’m aware they do not produce beers in the Brasserie. Anyway, the way it works is that every three weeks we get 231 pounds (approximately 400 USD) on our student ID cards and we have to purchase every item we consume at any of these three places. Flavorless Fish&Chips is a traditional plate over here. You also need to make sure you do not overspend (which is almost impossible because food is so expensive here!) because if you run out of money before the semester is over, you will have to purchase meals with your own money. Oh, I almost forgot to tell you that we also have a student bar on campus… Yes, you read it right! This is the reason why I sometimes forget that I’m school. 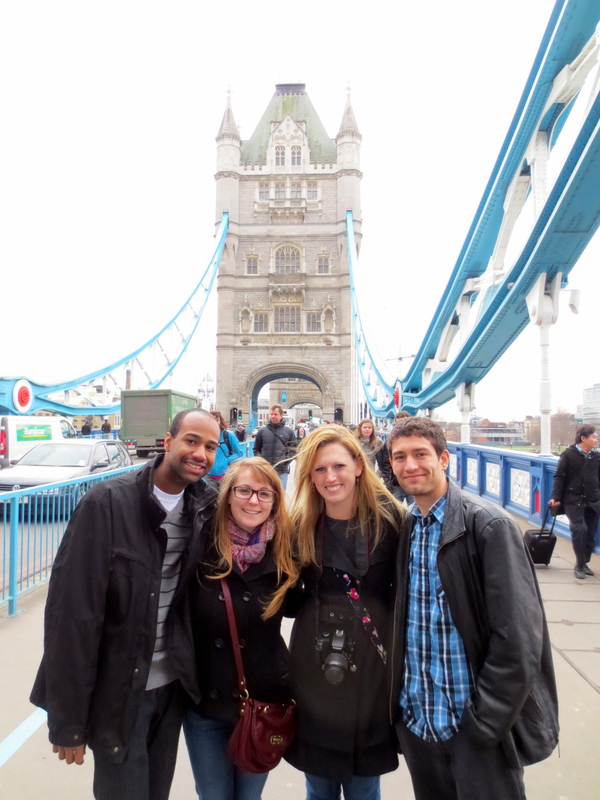 Saint Rose students, Pedro Chavez and Lisa Frye came to visit London from Alicante, Spain. I’ve been traveling around the world since I was 4. I have lived in many different places, and I currently live in what I consider one of America’s greatest cities: New York City. Well, London is beyond that. London is a very industrialized and technologically advanced city. People are very polite and well-educated. There is so much to see here that if I start writing about all of them, I would never finish. Anyway, I have met a lot of wonderful people, and have made great friendships. I have visited tons of places, including: the London Eye, Big Ben, Thames River (by boat), the Tower of London, the Tower Bridge, the London Bridge, Tate Modern, Buckingham Palace, Covent Garden, the Queen’s gardens, many royal parks, tons of free museums, and many other places that I can’t even remember! Not to mention all the nightclubs, restaurants and random places that I have been to! Last weekend, I went to Oxford and Stratford-Upon-Avon. Once in Oxford, I visited Oxford University where a lot of the Harry Potter movies were filmed. I also visited William Shakespeare’s birthplace in Stratford. I went to see the house he lived in with his wife and children, his grave and many other cool touristic places! 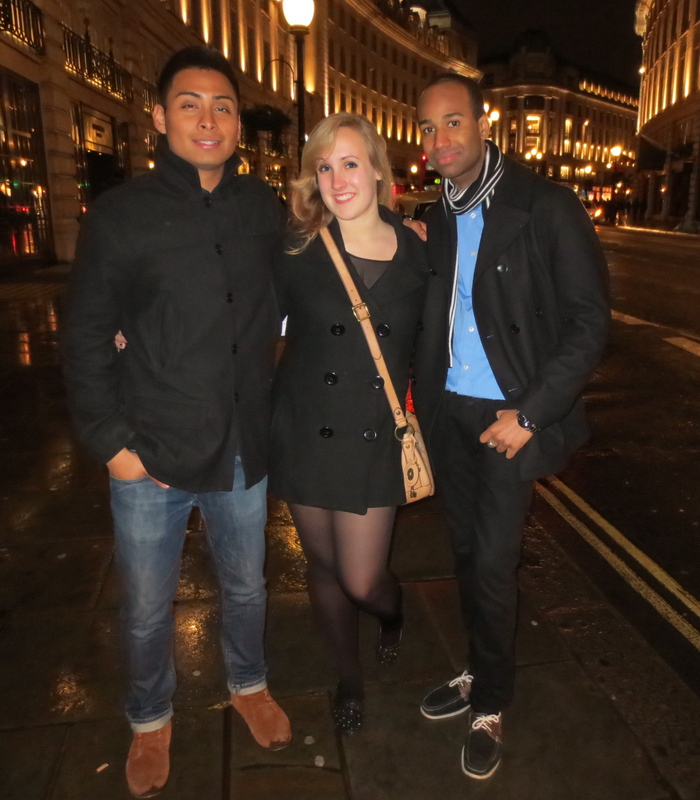 On my return from Stratford last weekend, I met up with Saint Rose students, Pedro Chavez and Lisa Frye who came to visit London from Alicante, Spain. Needless to say that I have taken lots of pictures (cause you all know how much I love PICTURES!!!!) and I’m sure you’ve all seen them on Facebook, which explains why I have like 10 thousand likes on my albums! Oh, guess what? For spring break, I will be traveling to France, the Netherlands, Belgium and Spain. I will be meeting up with other Saint Rose students that are currently studying abroad and some high school friends as well… and I am really excited for that! Overall, I’ve had a great study abroad experience so far. Living in such an industrialized city like London can be really fun, but you need to know how to budget yourself because the cost of living here is ridiculously high! Oh, wait a second… I almost forgot to tell you about how crazy the monetary system is. So here they have a one-cent and a two-cents coin, a 5,10,20, 25 and 50-cents coin, and they also have a 1-pound and two-pounds coin… crazy huh? Whoever developed the British monetary system must have been on something crazy because I do not see the point of having a one-cent and a two-cents coin! Also, keep in mind that if I ever move to London, I will lose 200 pounds (I’m talking about weight, not the currency LOL!) because I will walk everywhere and eat once a day so that I can save money! (At least I don’t see rats under the underground like I do in New York City, haha just putting that out there). Me and some friends at the Tower Bridge. It looks like you are having a blast! Enjoy your journey and have a wonderful and safe stay! Nice closing with monetary system!